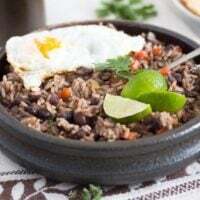 The national dish of Costa Rica, a savory breakfast dish consisting of black beans and rice, topped with fried eggs. A surprising dish this Gallo Pinto. For us at least. Imagine having rice and beans for breakfast. Not a common thing for us Europeans. In Romania, breakfast would consist most of the times of some white bread with cheese, cold meats or eggplant spread and some tomatoes or cucumbers. In Germany, a typical breakfast would be rolls or bread with butter/quark and jam or, for a healthier option, müsli. The most out of ordinary breakfast I have ever had was the English breakfast with sausages and baked beans. But a cooked meal with rice and beans for breakfast, well, I’ve never consider making anything like it. Until now. But I have to admit we didn’t really have it for breakfast, it was more like a brunch, a very late breakfast at about 11.30 in the morning, almost lunch time. I told my husband I was cooking this on a Saturday morning and he suggested that, considering the heartiness of the dish, we might wait with having breakfast until later and thus skip a whole meal. We did and it was a good thing to do. 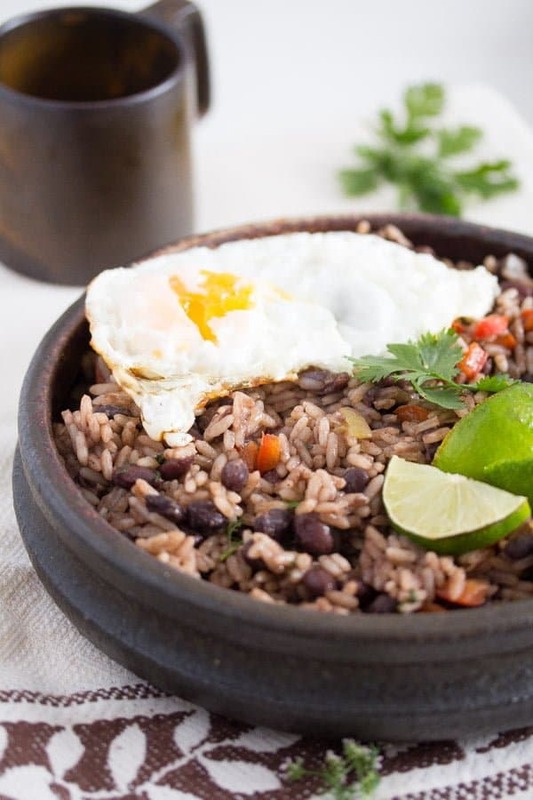 This Gallo Pinto or Black Beans and Rice is such a complete meal, it will keep you satisfied for hours and hours, really no need for lunch when you had rice, beans and fried eggs for breakfast. The origins of the gallo pinto or “spotted rooster” are not really known. Costa Rica claims that the dish was created sometimes in the 1930’s while Nicaragua claims that the dish was brought to their country by African slaves, long before the dish even became known in Costa Rica. 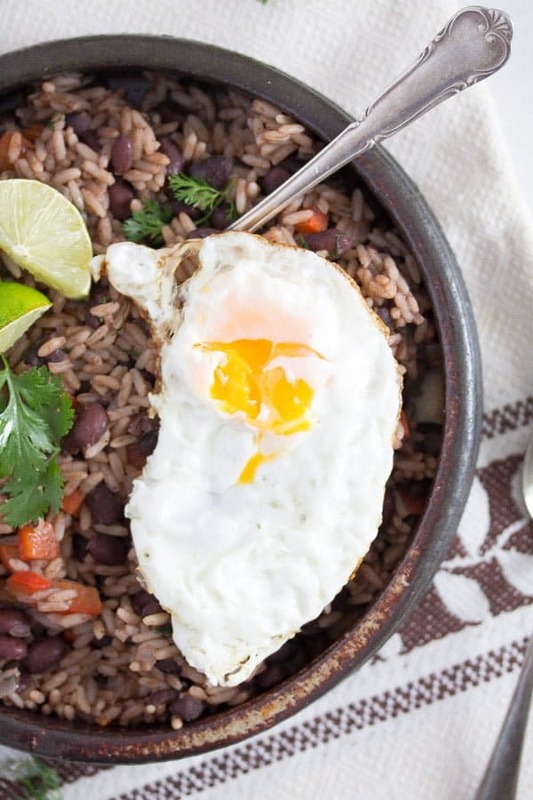 Apparently there is a big rivalry between Costa Rica and Nicaragua when it comes to gallo pinto, both countries claim this dish to be their own. There are slight differences between the way the gallo pinto is cooked in these two countries. 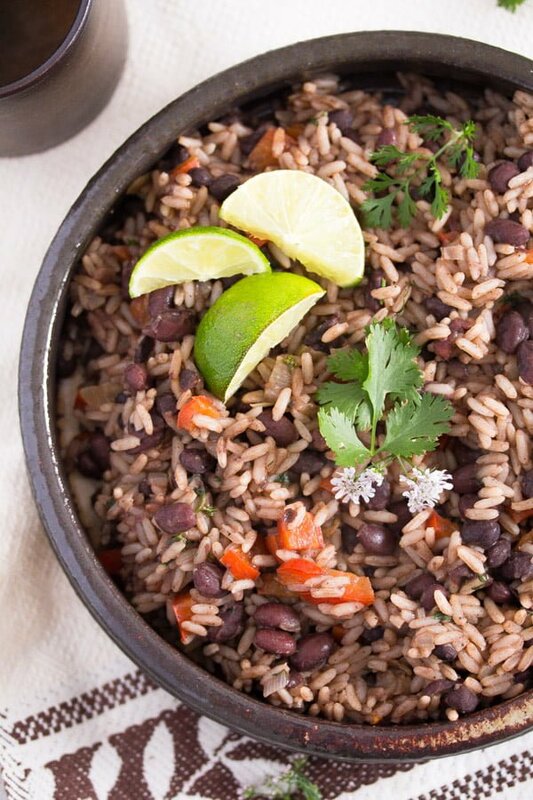 The Nicaraguan people use kidney beans, while in Costa Rica black beans are used instead. Another very typical thing to use in Costa Rica is the Lizano sauce, which gives the Costa Rican gallo pinto its special flavor. I tried to get the Lizano sauce myself but, of course, I failed in this task. So I have searched online for an alternative and found out that Lizano sauce is a brown sauce similar to Worcestershire sauce. So, I used that instead and I really cannot complain at all. The gallo pinto or the Costa Rican black beans and rice were amazing. 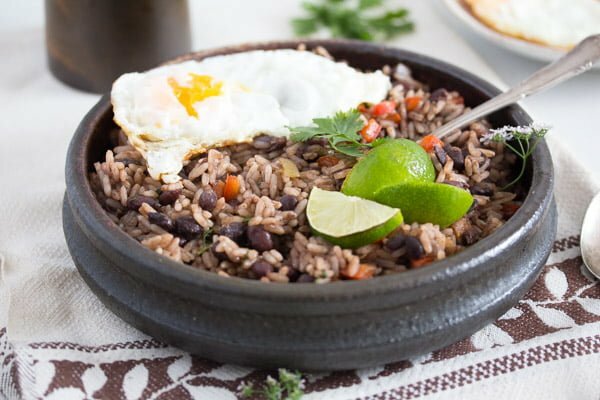 The recipes for gallo pinto vary a lot, just like in the case of any dish that is considered a national dish in any country of this world. Take the Romanian cabbage and rice rolls for instance, everybody in Romania makes them, they are the best known Romanian dish probably, but I don’t know two women to make them exactly the same way. I got the recipe for Sarmale from my grandmother, but my rolls are still slightly different than hers. It is the same with gallo pinto. The main ingredients for the Costa Rican gallo pinto are black beans and rice, but every recipe I read was different than the other. In the end, I came up with my own version, while trying to respect the rules of making a proper gallo pinto. I hope I have succeeded, I am not sure how authentic this is (I have tried my best), but it was definitely perfectly delicious! Start a day ahead by cooking the rice. Let it cool down, cover it and place it in the fridge until the next day. Apparently having cooked rice in the house is very common in most Costa Rican homes, so cooking the rice extra a day ahead is not really necessary there. However, we do not eat quite as much rice here, as to always have some leftovers in the fridge, so that is why planning ahead is a good idea if you want to have some gallo pinto for breakfast or lunch. 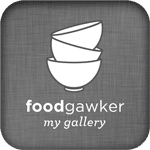 I cooked about 250 g/ 8.8 oz/ 1 1/3 cup rice and had about 750 g/ 26.4 oz/ 4-5 cups cooked rice. It was enough for 4 people and we had some leftovers. 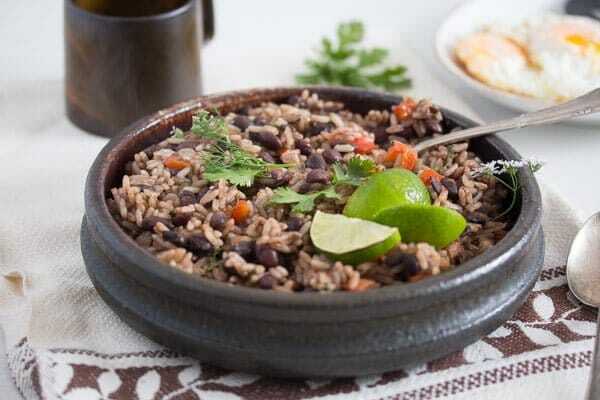 The Costa Rican version of the gallo pinto uses black beans. I used canned black beans and their cooking water to make this dish. I have read somewhere that using the water from the can or cooking water from the beans is very important for an authentic gallo pinto, so I did not want to miss on that. I use cooking water from the beans often, either when making bean soup or a bean dip or spread, so I know for a fact how much flavor they can add to any bean dish. As mentioned above, typical for the Costa Rican rice and beans is the use of Lizano sauce. However, as this sauce is not easily available outside Costa Rica, substitutes had to be found. I used Worcestershire sauce instead. So, when using canned black beans and having cooked your rice the day before, preparing the gallo pinto couldn’t be easier. Start by frying your vegetables (onion, red pepper, garlic) in a little oil. Add the canned beans and their water, some sauce and let get warm for a few minutes. Add the cooked rice and warm the whole dish through. Now you just have to add some herbs and spices and you’re done. No wonder, the gallo pinto is such a favorite for breakfast. It is made in no time, it is thoroughly nutritious and filling and tastes so good. Give it a try, I am pretty sure you would love it. Start a day ahead. Cook the rice in salted water until tender. Drain well, let cool, cover and refrigerate until the next day. Finely chop the onion. Chop the garlic cloves, but keep them separated from the onion. Chop the red bell pepper into small cubes. Heat the oil in a Dutch oven or another heavy bottomed pot. Cook the onion until translucent. Add the garlic and the red bell pepper and cook on medium low heat for about 4-5 minutes or until softer. Add the black beans and the water from the cans as well. Stir well and add the Worcestershire sauce. Heat for about 5 minutes, stirring from time to time, it should not get too dry. Add the cooked rice and stir carefully but thoroughly. Let the rice heat through, about 5 minutes, stirring often. Give the chopped herbs to the rice together with the salt, pepper and the juice of 1 of the limes. Adjust the taste with more salt and Worcestershire sauce, if necessary. Fry the eggs in a large non stick pan. Heat 1 tablespoon oil in the pan. Carefully crack the eggs into the pan. Cook the eggs on medium low heat until the whites are set, but the egg yolks are still runny. If you like your egg yolks to be set as well, you can carefully turn the eggs with a spatula and cook them on the other side for about one minute. 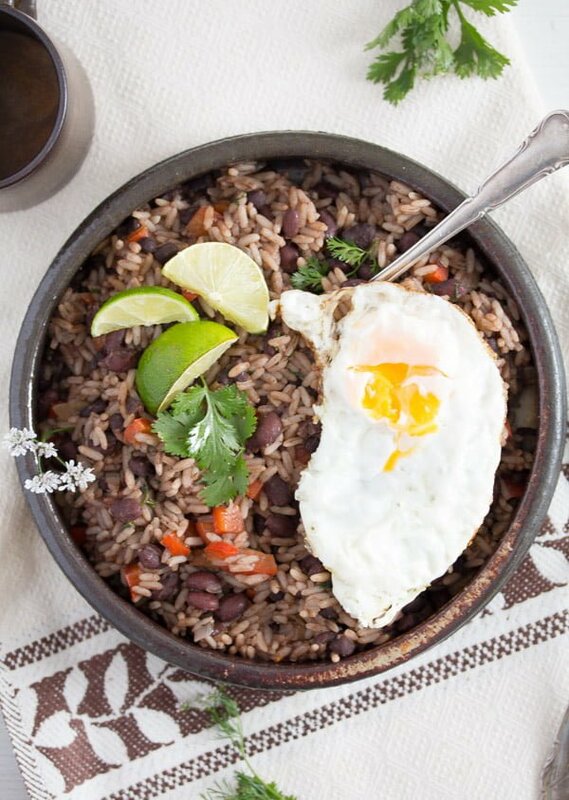 Serve the gallo pinto with lime wedges and a fried egg on top. Note 1: You will have 750 g/ 26.4 oz/ about 4-5 cups cooked rice. Note 2: The Worcestershire sauce is a substitute for the Lizano salsa, which is typically used for making Costa Rican gallo pinto. If you have access to it, use it instead, according to taste. It looks delicious. I could eat that for breakfast. We are used to having a hearty breakfast and a very light dinner (omelette or soup most days). I should try this, is looks similar to a Panamian recipe I’ve made, with beans and rice. I would definitely not mind having this for breakfast or any meal! Looks perfect with that egg on top. A vegetarian friend told me the mixture of rice and pulses is very healthy and important for vegetarians (I don’t know the details though, but it’s something about the proteins’ intake, though I might be wrong). Looks delicious! Love all the information you shared about it! Also love your blog and all the ethnic recipes. I’ve subscribed to your mailing list so I don’t miss any of them! Amazon has Salsa Lizano. It’s well worth ordering if you’re making Gallo Pinto. I know, I checked, but here in Germany is so expensive!